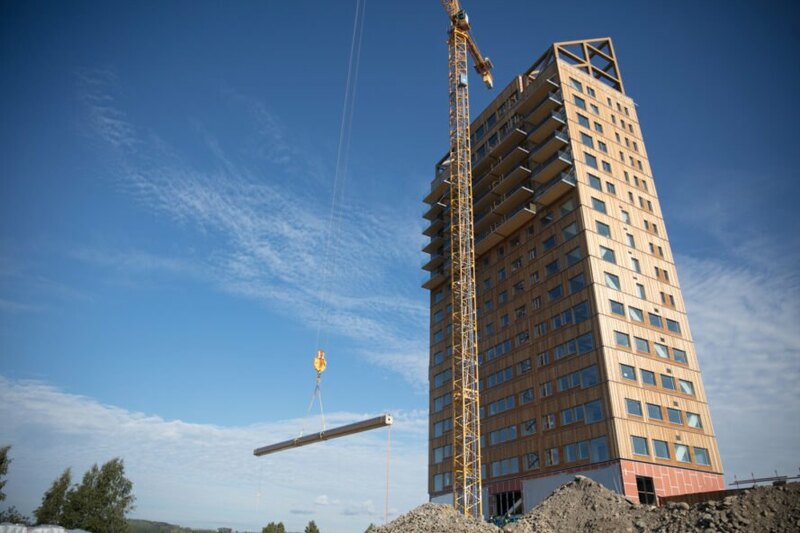 In March 2019, the Mjösa Tower became the tallest wooden building in the world at 18 floors (for a total of 85.4 meters tall), followed closely by the HoHo Wien building in Austria (84 meters) and the Peri-Săpânţa Monastery in Romania (75 meters). Because it was made in part with Kerto LVL wood that is both sustainable and green, the building is eco-friendly as well. While both the skeleton and the facade of the building are made of wood, the decks on the upper floors (apartments) utilize concrete to prevent swaying. The bottom 10 floors contain the majority of the Kerto LVL wood and are comprised of hotel facilities and offices. Because the wood is such high quality and lightweight, construction is faster and, in turn, uses less resources. 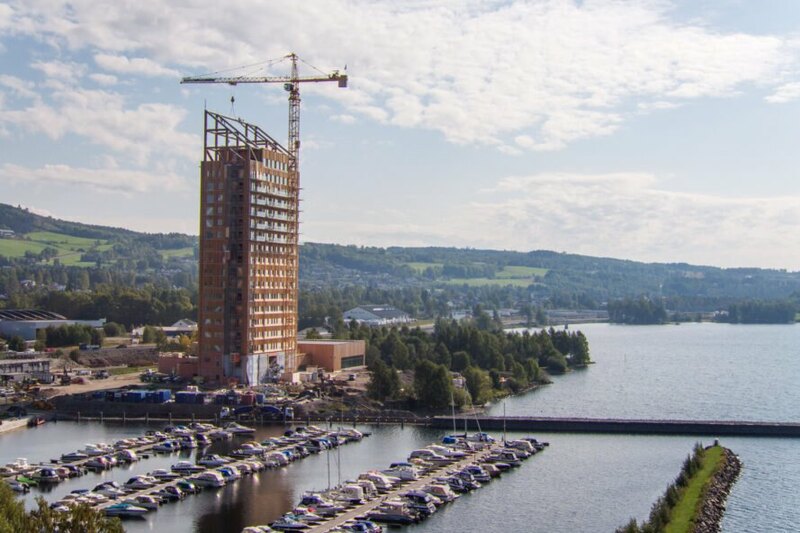 Being a wood building, the Mjösa Tower was designed with fire safety in mind. In addition to a building-wide sprinkler system, each floor is built compartment-style with materials (such as Kerto LVL and glulam timber) with 90-minute fire resistance capability. According to Metsä Wood, when exposed to fire, the untreated, solid wood chars on the outside and provides its own fire-resistant surface. Kerto LVL wood is a laminated veneer lumber, made using thin rotary-peeled softwood glued together to form a continuous chunk of wood. It’s super strong, durable and doesn’t warp, making the wood ideal for adding substantial strength to floors and beams. Additionally, the Finnish company Metsä Wood produces the material using 100 percent bioenergy with little to no waste. The unusable segments of the wood left after the manufacturing process are either used for pulp production or for bioenergy to run the mill. Even better, there is a bio-heating plant next to the mill that’s used to power the wood production, and the remaining energy is used to help power the neighboring town of Lohja. The Metsä Wood company is certainly a large contributor to Finland’s goal to reduce greenhouse gas emissions by 80 percent by 2030. Mjösa Tower is a symbol of changing trends in the construction community. It proves that massive structures can be produced using sustainable materials without compromising quality. 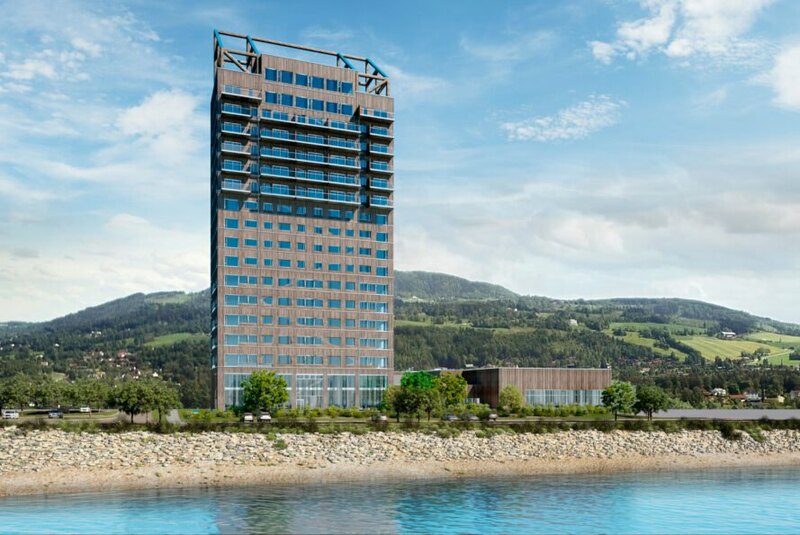 The building’s designers at Voll Arkitekter hope the the tower will inspire other architects to build using sustainable materials like wood. 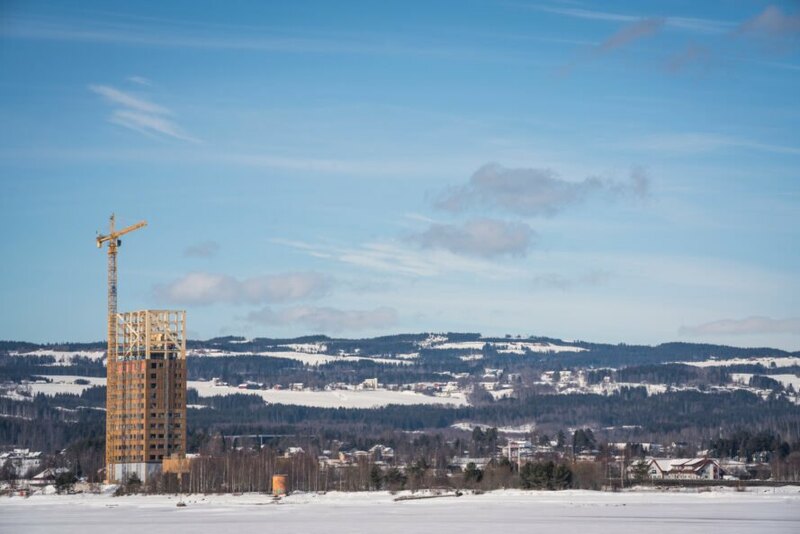 The tallest wooden building in the world has just been completed in Norway. The structure is comprised of durable, fire-resistant wood. The Mjösa Tower rises to 85.4 meters high. Even the materials are made sustainably — the wood is produced using bioenergy. The design team hopes the tower will inspire other architects and designers to embrace sustainability.